Back in March I posted pictures of a Mah Jongg set I had purchased and asked for some help on trying to figure out what the heck it was! 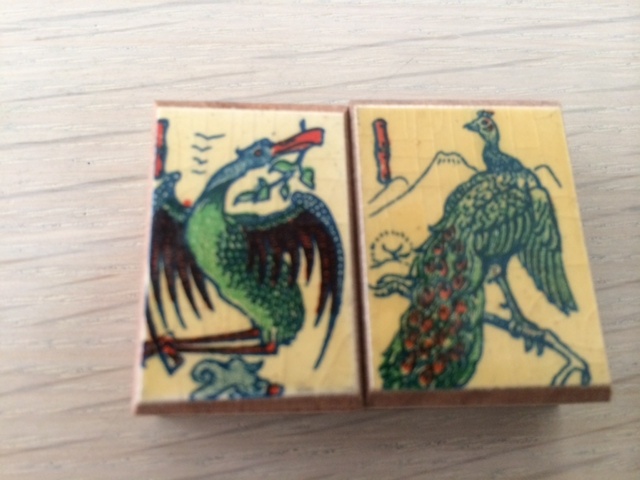 I also asked if anyone had some tiles in their orphanage to replace the missing tiles from this unusual set. Well, all good things certainly do come to those who wait. Dear Tony Watson, Mah Jongg authority and historian extraordinaire, has sent the following explanation. The original post follows Tony’s explanation. Now all I have to do is wait some more and perhaps someone will be able to help me fill in my missing tiles! Much thanks and lots of hugs to Tony! Zooming in on the pics, it looks like the tiles are made of hardwood with either a slip of printed acetate melted onto the top (either by heat or solvent), or more likely, given the crazing, a thick layer of paint with a transfer applied and sealed with a coat of shellac. Very similar construction is used in Richter’s ‘stone’ tiles. 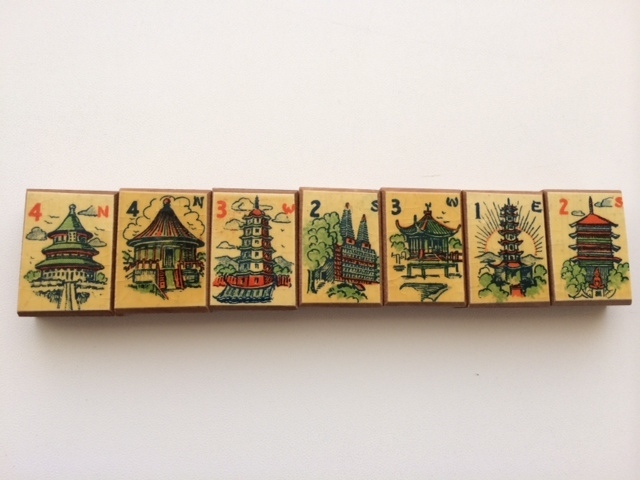 Anyway, I’ve not seen these tiles before, but they have shades of the French and Austrian sets that we have seen recently, especially the Lizard set. A few months ago I purchased this unusual set and am still at a loss at trying to identify it. Perhaps someone out there reading this blog will be able to help…It seems to be very similar in composition to the Portland Billiard Ball Company set that was featured on this blog last month. 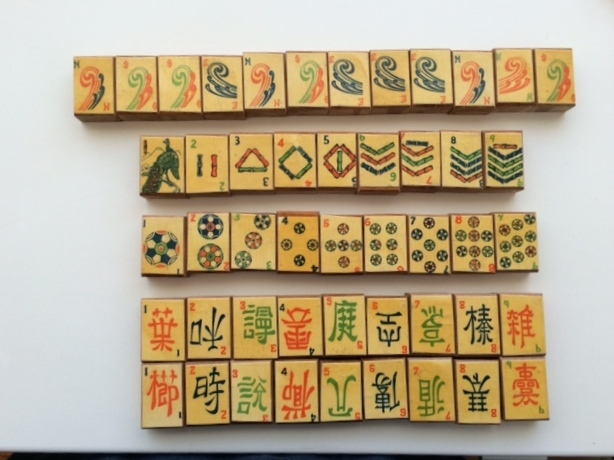 The tiles are blocks of what I suspect is bamboo with thin pieces of colorful plastic/celluloid glued or somehow affixed to the wood. The Bams and the Dots are easily identifiable – although I suspect I may have displayed the Bams upside down! But it is the Craks that has thrown me way off…Here are two rows of the Craks (1 – 9) and, as you will see, the symbols in the first row are quite different from the symbols in the second row. Each Two Crak is unique. Have you seen this before? And the depiction of the Winds is lovely (although possibly upside down again!). Unfortunately, the set is missing the four West Winds. 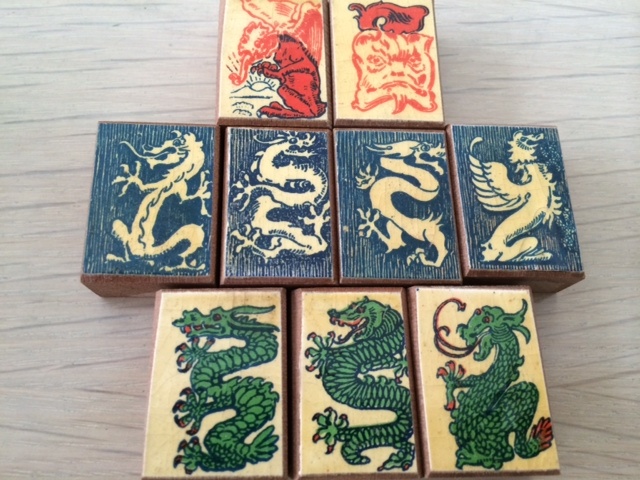 Both the One Bams (missing two) and the Dragons (missing two Red Dragons and one Green Dragon) show different images. BTW, if anyone can supply the missing tiles, please contact me. This entry was posted in Mah Jongg and Me and tagged bamboo, bams, celluloid, craks, dots, dragons, mah jongg, orphanage, plastic, Portland Billiard Ball Company, Tony Watson, winds on August 31, 2014 by Mah Jongg and Me. Need to write a thank you note after attending a great luncheon and an afternoon of Mah Jongg at a friend’s home? 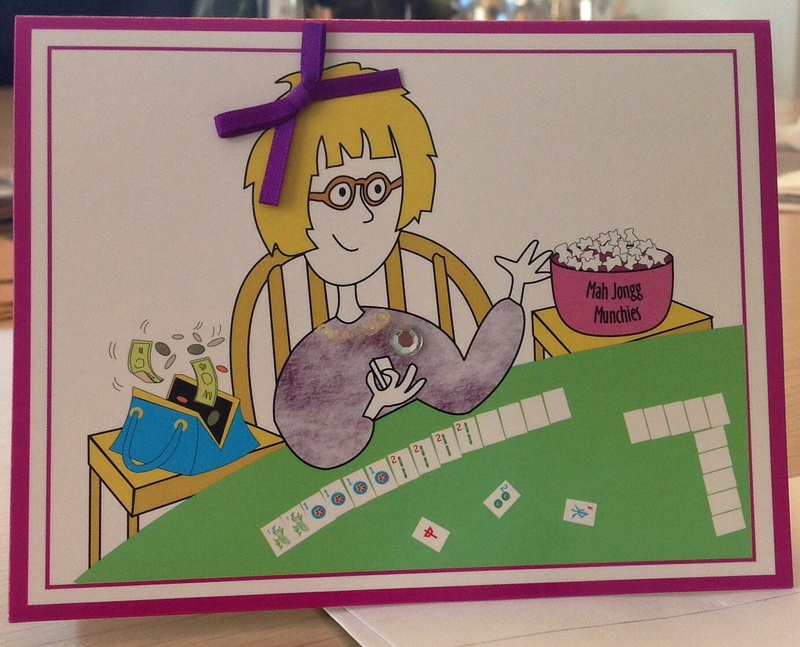 Or looking for a cute notecard to use as an invitation for a day of Mah Jongg chez vous? 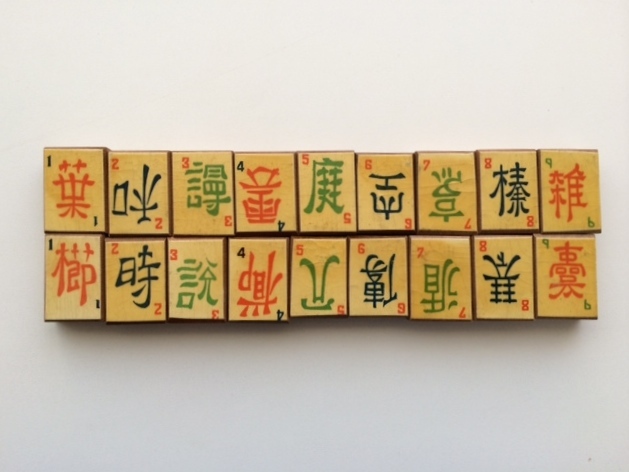 Well, look no further than www.wherethewindsblow.com for this darling set of handcrafted Mah Jongg- themed notecards. SPECIAL PURCHASE! 10 precious note cards with envelopes for only $8.49 ($1.00 S&H). 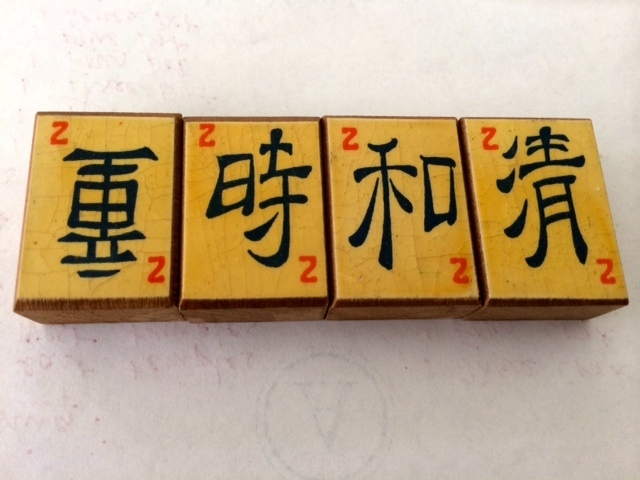 The 5 1/2 x 4 1/4 (top folded) cards are blank inside allowing for use as invitations to a Mah Jongg party or quick notes to a friend or loved one. Each card is handcrafted. This entry was posted in Mah Jongg and Me and tagged mah jongg, where the winds blow on August 30, 2014 by Mah Jongg and Me. This entry was posted in Mah Jongg and Me and tagged Apple, genius bar, Mac, mah jongg on August 29, 2014 by Mah Jongg and Me. I don’t know about you and your Mah Jongg groups but I know that when the OMs are playing…and chatting…and laughing…(and sometimes drinking a glass or two of wine! )…we often can’t remember where we are with the Charleston. Sound familiar at all? Well, confusion be gone! Marcee Kleinman, a programmer and a serious Mah Jongg player in Los Angeles, has developed an app for all of us in need of a gentle reminder with the Charleston. The app can be found on iTunes and while you are at it, go to the Mah Jongg Groove Facebook page and hit “Like” to show how much we appreciate a fellow Mahj player developing great apps for us! This entry was posted in Mah Jongg and Me and tagged Charleston, Facebook, mah jongg, Mah Jongg Groove, Marcee Kleinman, MK Mobile on August 28, 2014 by Mah Jongg and Me. I just spoke with the very delightful Lynn Chorn, the new owner of the fantastic website, www.wherethewindsblow.com. 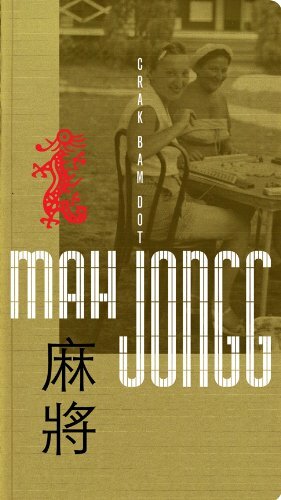 She only has FOUR copies left of this wonderful souvenir book from the Project Mah Jongg exhibit. Lynn told me that she has contacted the publisher, 2wice Arts Foundation, but they have no more copies to sell. So, if you are interested in this special book – and at a very reduced price – contact Lynn right away because these books are going, going…gone soon! This entry was posted in Mah Jongg and Me and tagged 2wice Arts Foundation, Crak Bam Dot Mah Jongg, Lynn Chorn, mah jongg, project mah jongg, where the winds blow on August 27, 2014 by Mah Jongg and Me. Today’s posting is about a book that is fairly new – it was first published in 2003 but then Tuttle Publishing translated it into English and published the book in 2007 for the American audience. 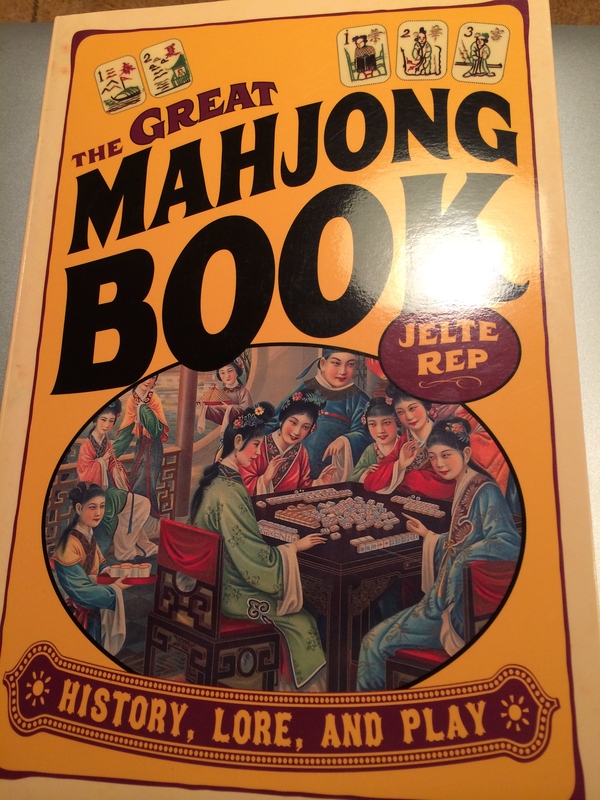 The book is written by Jelte Rep, a Netherlands native who, when not playing Mah Jongg, makes documentary films and writes dramatic television shows. 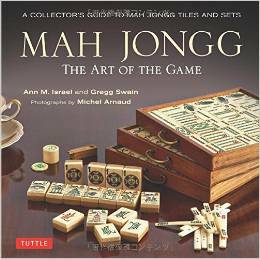 He is a great Mah Jongg enthusiast and his book is very thorough. 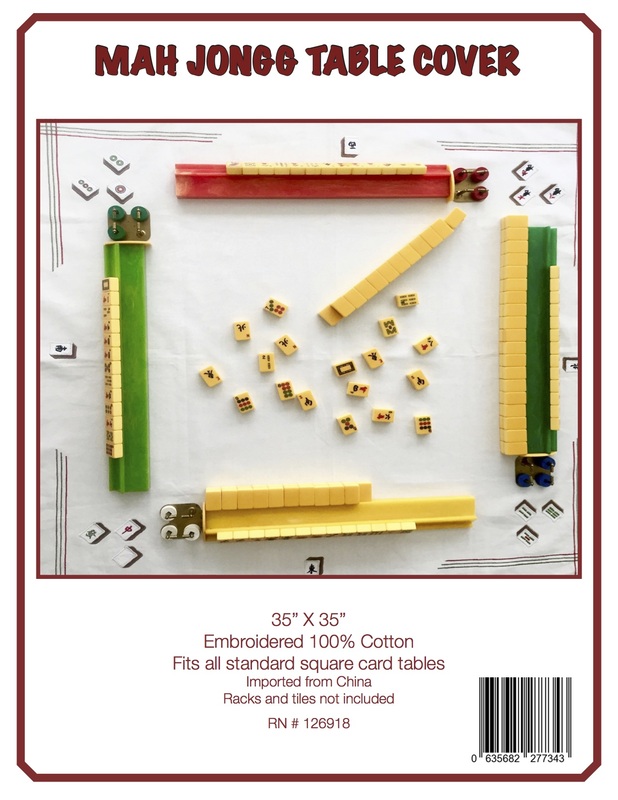 This entry was posted in Mah Jongg and Me and tagged Jelte Rep, mah jongg, Mah Jongg: The Art of the Game, National Mah Jongg League, Netherlands, nmjl, sloperama, The Red Dragon & The West Wind, Tom Sloper, Tuttle Publishing, Viola Cecil on August 25, 2014 by Mah Jongg and Me.